Since the Defence White Paper 2013 emphasises the Defence of Australia, it’s useful to look at where we would be able to project force under the cover of our own airbases by having a standing fighter patrol, or ‘Combat Air Patrol’ (CAP) overhead. The picture that emerges is perhaps surprisingly limited. Figure 2. 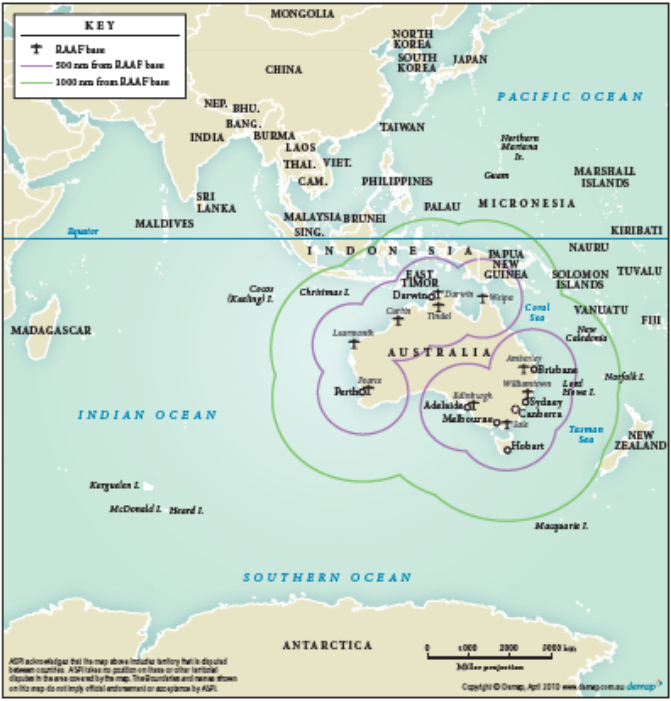 Approximate ranges from Australian bases at which an F-35 JSF aircraft could remain on station for an hour. The inner line is for unrefueled aircraft. The outer line assumes an air-to-air refuelling at 500nm from base. (Source: ranges estimated from December 2009 Selected Acquisition report data.) Range rings for the Super Hornet with a weapons payload would be smaller. These range curves show where Australia’s fixed-wing air power, if limited to bases on Australian soil, will be able to establish air cover for operations close to the mainland, although care needs to be taken in interpreting the diagram. Whether we can marshal sufficient numbers of aircraft to outgun an adversary is another question entirely. A single aircraft can remain on station for an hour at the outer edges of the range rings—maintaining two or more aircraft on station continuously would demand a rate of effort that would quickly run down the Air Force’s capability. However, provided the tanker aircraft can be protected, there will be at least some capability to extend air cover into some—but not all—of the ‘immediate neighbourhood’ as identified in the White Paper; Indonesia, Papua New Guinea, East Timor, New Zealand and the South Pacific Islands. But this doesn’t imply either that the Air Force’s capability is sufficient or insufficient to provide for the defence of Australia and its immediate environs, or to conduct maritime strike operations—that will depend on the scale of force brought by an adversary and the dispersal of those forces. It’s much easier—although still resource intensive—to maintain an air presence close to home, because the crucial elements are distance, access to basing, and timing. The further the aircraft have to operate from their base, the harder it is to maintain an operational tempo. A corollary of this point is any would-be aggressor would have difficulty in sustaining an air presence close to our shores. If we wanted the ADF to be able to provide air cover for the entire immediate neighbourhood, then we would need to use bases located in other countries. If we were helping a neighbour defend themselves we would be granted access. If a neighbour was attacking us or providing passage to someone else to attack us, we would not be granted access. That leaves the case of uninvolved third parties. While that’s possible in principle—Australia’s interests might well align with an otherwise uninvolved party—it can’t be guaranteed. If we wanted to support air operations from a base located in a neighbour’s country, for a conflict which that neighbour wasn’t a part of, it would be reasonable for them to say no. It’s possible that this picture will change in the future with the emergence of long-range drones suitable for air to air as well as air to ground tasks. But that day is a probably a long way off yet, although we should remember Moore’s Law when making such predictions . This picture should be compulsory reading for anyone contemplating ADF maritime power projection operations. Unless they are relatively close to home, they’ll be done without persistent fixed wing air cover. Of course, a DDG (air warfare destroyer) along with a task group would provide protection against air attack to a point, but we’ve just rediscovered why USN battle groups have a carrier sitting in the middle.